Attorney Matthews is a 1976 graduate of Boston College and a 1985 graduate of Suffolk University School of Law. She was admitted to practice law in 1985. 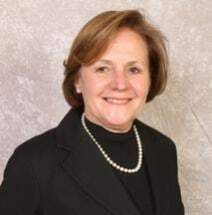 From 1985 through 1988, Attorney Matthews was an Assistant Attorney General in Consumer Protection Division of the Massachusetts Department of the Attorney General where she handled litigation in the Superior Court. From 1988 through 1989, she was an Assistant Attorney General in the Executive Division where she handled administrative appellate matters. She joined Cosgrove, Eisenberg and Kiley, P.C. in September 1990 and continued in this firm until June of 1999. While at the firm during that time she concentrated in domestic relations and employment law. Since 1999 Attorney Matthews has practiced law as a sole practitioner in Canton, MA concentrating on zoning and real estate law, domestic relations and civil litigation. In 2009, she rejoined Cosgrove, Eisenberg and Kiley, P.C. on a part-time basis, where she again focuses on the practice of domestic relations and civil litigation. She also continues to handle real estate and zoning law. Attorney Matthews is a member of the Norfolk Bar Association and the Massachusetts Bar Association.